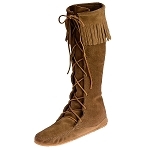 With 2, 3, and 5 layer fringe boots, finding a pair of women’s fringe moccasin boots to suit your individual style on Moccasins Direct should be quite an easy task – or perhaps a difficult one as you ponder over the vast selection available for that perfect pair, because we guaranteed you’re going to find more than one that you’ll absolutely fall in love with. 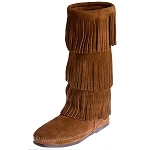 Moccasins Direct offers more than 50 different styles of Minnetonka fringe boots so that even if you’re the pickiest person, they’ll still be something for you. 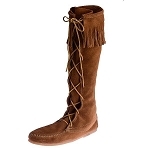 Finding a pair of women’s fashion boots may seem daunting, and you may feel like all Minnetonka moccasin style boots are the same, but that’s where you’re wrong. 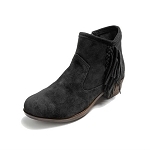 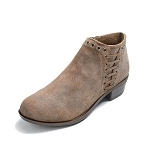 With such a high selection of women’s fashion boots available at Moccasins Direct, there is actually a great variance on style, colours, cuts, and fabrics. 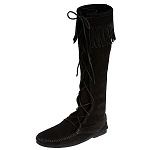 You can purchase the standard ankle high or even knee high (or both!) 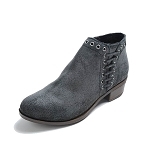 depending on the season, weather, or simply just preference.